RIT provides a unique, multidisciplinary ecosystem aimed at promoting and supporting innovation and entrepreneurial endeavors of its students, faculty and staff. That network includes the Construct student makerspace. The Albert J. Simone Center for Innovation and Entrepreneurship, which offers interdisciplinary curriculum, experiential learning through the Student Incubator, coaching, access to the Construct student makerspace and events such as the Summer Start-Up program, IdeaLab@RIT, Tiger Tank, RIT Business Model Competition and Access Technology Product Competition. 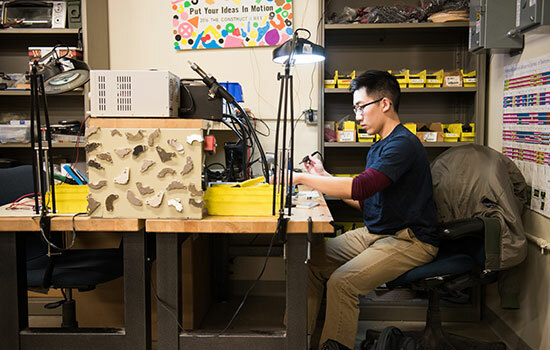 Venture Creations, RIT’s business incubator, which provides services to start-ups whose products and services advance educational and research missions. Center for Urban Entrepreneurship, located in RIT’s Downtown Center at 40 Franklin St., which provides business and consulting services to anyone who wants to launch or maintain a business within the city of Rochester. Saunders College of Business, which supports and funds a variety of programs, including Tiger Tank, Summer Start-Up and Business Model Competition. The college also offers a minor concentration in entrepreneurship, which involves an applied-learning field experience and gives students the opportunity to earn credits for advancing a business concept. Studio 930 RIT Design Consultancy, which focuses on experiential learning and production technologies and products that help people with disabilities. Co-Up, co-sponsored by the Simone Center and Center for Media, Arts, Games, Interaction and Creativity (MAGIC), which provides summer internships on multidisciplinary teams with projects in digital media. National Technical Institute for the Deaf, which hosts “Next Big Idea,” an annual innovation competition in which teams of deaf and hard-of-hearing students create a product, business, service or type of technology that solves a problem or eliminates an existing challenge for potential consumers and/or users. In 2017, NTID and the Simone Center received a grant from the National Science Foundation Innovation Corps to provide support for deaf and hard-of-hearing entrepreneurs in the STEM arena. RIT Venture Fund, launched in 2012, provides investment capital and guidance to entrepreneurial ventures with a strong connection to the RIT community. The fund has become an integral component of an ever-expanding entrepreneurial ecosystem in the greater Rochester region. RIT student representation at regional, state and national entrepreneurship competitions such as Digital Rochester GREAT Awards, Rochester Venture Challenge, 43 North and the New York State Business Plan Competition. The B. Thomas Golisano College of Computing and Information Sciences opened at RIT in 2003. The largest of the university’s nine colleges, it is home to RIT’s computer science, computing security, information sciences and technologies, and software engineering departments, as well as the Ph.D. program in computing and information sciences, and the School of Interactive Games and Media. In 2012, RIT became one of the first universities in the nation to launch an academic department devoted solely to computing security. As a National Center of Academic Excellence in Cyber Defense Education and for Cyber Defense Research, designated by the National Security Agency and Department of Homeland Security, RIT is helping to fill a national need for qualified computing security professionals. In 2014, RIT received a nearly $4 million grant from the National Science Foundation to become a part of the federal CyberCorps: Scholarship for Service program, which can provide full tuition and a stipend in exchange for future government service. The program was established in 2000 in response to ongoing threats to the nation’s information technology infrastructure. It serves as a deal for students and gives government agencies an exclusive talent pool from which to recruit. Through the Center for Cybersecurity, founded in 2016, the university is bringing together expertise from across RIT to better understand and address real-world challenges in cybersecurity. Faculty and student researchers are developing human-centered projects that will help people and organizations get and stay ahead of their adversaries. At the same time, student penetration testers in the center are gaining experience, as they are hired to test a business’s networks, create a report and make recommendations about its cybersecurity needs. RIT students are also consistently among the top contenders at the National Collegiate Cyber Defense Competition, an extracurricular event that helps to train the next generation of cybersecurity experts. RIT teams placed third in 2015, second in 2014 and won the national title in 2013. And the university annual hosts a national competition focused on penetration testing for cybersecurity. Austin McChord is the founder and CEO of Datto. Since McChord started the company in 2007 from a basement in Norwalk, Conn., Datto has experienced unprecedented growth. Datto has also received numerous industry awards for company growth, product excellence and technical support. McChord’s vision to bring enterprise-grade data protection solutions to small and midsized businesses is the driving force of the company. Today, hundreds of thousands of businesses are protected with Datto technology, delivered exclusively through Managed Service Providers. McChord is a frequently recognized entrepreneur who was named an Ernst & Young Technology Entrepreneur of the Year in 2016 and to the Forbes 30 under 30 in 2015. He has a degree in bioinformatics from Rochester Institute of Technology and holds several patents. Datto protects business data and provides secure connectivity for tens of thousands of the world's fastest growing companies. Datto’s Total Data Protection solutions deliver uninterrupted access to business data on site, in transit and in the cloud. Thousands of IT service providers globally rely on Datto’s combination of pioneering technology and dedicated services to ensure businesses are always on, no matter what. Learn more at www.datto.com.